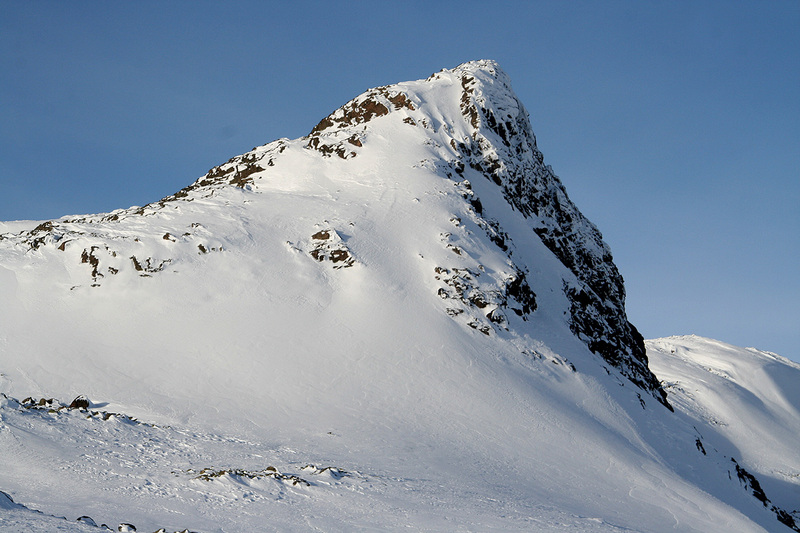 How to get there: This mountain is located north of lake Vangsmjøsi. This lake is located near the end of the big valley called Valdres. More precisely, drive Hwy. E-16 (in the direction from Oslo to Bergen), locate the small village Fagernes and continue approximately 48 more kilometer. Near this point, a bridge crosses north. There is a sign saying Slettefjellet or Slettefjellveien. If you drive from Bergen towards Oslo, proceed about 27 kilometer from the intersection named Tyinkrysset, you drive through the village of Vang, then another 4-5 kilometer. Cross the bridge and continue towards Slettefjellet. You will arrive at a toll gate. There is parking for 2-3 cars on your left. The road ends here in winter. This is the trailhead, location N61:10.645, E008:41.787, elevation about 708 meter. 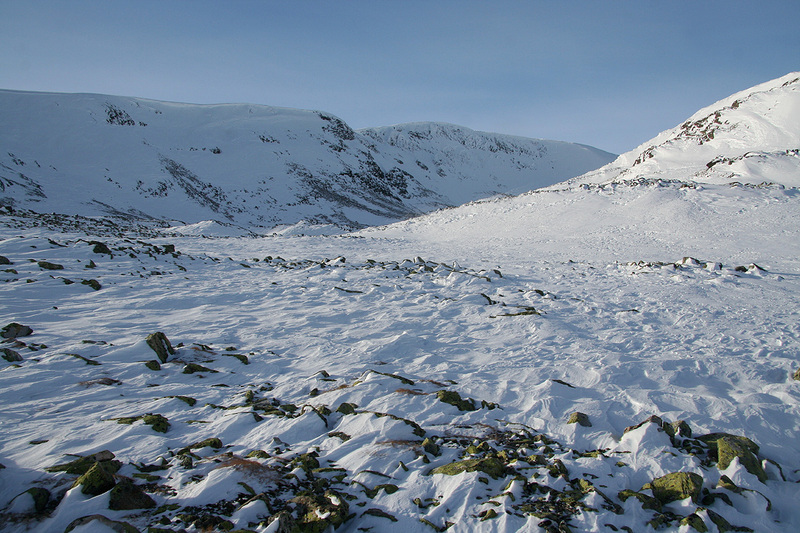 Route description: Ski (or walk) along the road that continues across Slettefjellet, but fork left as you climb the hill on the right side of the river that comes down from the valley Rysndalen. There are som huts higher up, Nefstadstølen and Brubakken. This area is convenient for crossing the river and continue uphill on the opposite side. Going west or slightly south of west, climb this gentle slope to about the 1300 meter level. Two small valleys run more west from this plateau, set your course for the leftmost, the one that holds lake 1514 at its end. Shortly before reaching this lake, ascend the slope on your right (easy) in order to gain the ridge separating the two valleys. The next (quite short) section of this ridge is the only slightly steeper part of this route. A ledge, about one meter wide, serves as a ramp going diagonally from your right to higher terrain further left. From here, one can again ski up towards the right and onto the upper part of the ridge which is less steep and provides access to the higher ground behind. Finally, ski left of lake 1610, up the hillside to the broad col, then slightly more right as you cross the very gentle terrain to the highest point with a prominent cairn. Comments: We started from Bergen at 0730 and parked at the gate to the road across Slettefjellet (closed in winter) by 1145. Leaving the car at 1200, we hiked a few hundred meter (west) along the road to the next farm where we followed an old ski track that climbed through the birch forest. We soon left the track and headed up the large slope in a direction towards lake 1514. It turned out that there was a pretty hard and icy crust almost everywhere. As we hit the creek that runs down a fairly broad and distinct, but very shallow gully, we skied directly uphill here until reaching the plateau above. The next section of our route had little snow and many rocks, to find the best way on snow turned out to be tricky. We entered the small valley towards lake 1514, climbed the ridge on its east side and discovered a reasonable route up the ridge, just as guessed from looking at the map beforehand. The wind picked up and with the temperature already near minus 20, I needed more wind protection and we both needed our heavy duty down mittens. Proceeding just left of lake 1610, we ascended to a new, broad col, then skied easily the last kilometer to the summit. 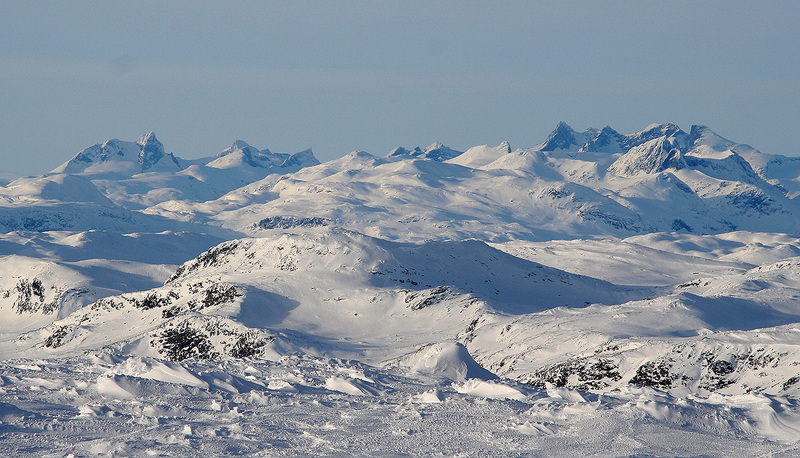 This summit has a very nice panoramic view of Jotunheimen. Unfortunately, the wind and the cold called for a rather limited stay. We reached the summit at 1505 and were on our way down by 1520. The descent was (much) easier than the ascent. 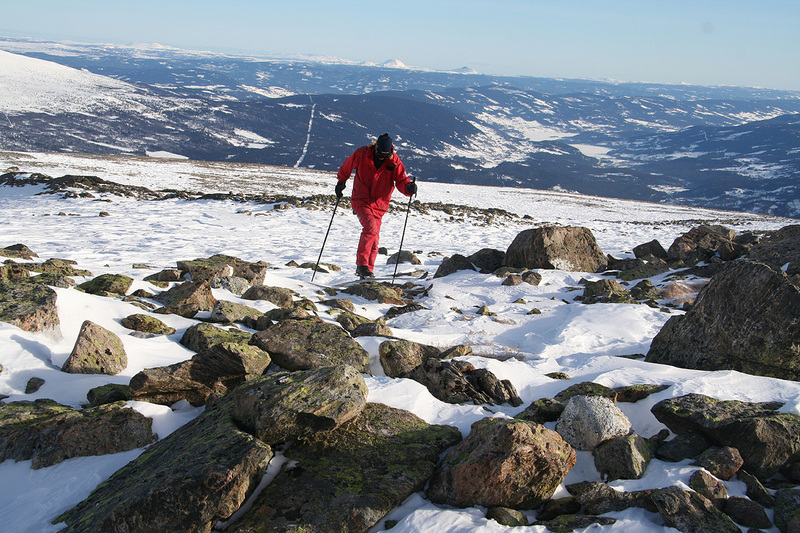 We found a much better route through the area with more rocks than snow, then skied down somewhat further east. We crossed the main creek near a few huts and proceeded to ski down on the closed road on Slettefjellet. In this way, we arrived swiftly directly back to our car at 1640. Vennisfjellet as seen from Vang. Pål Jørgen skiing on Vennisfjellet. Valdres behind. Our route entered this valley. The end of the ridge separating the two valleys. 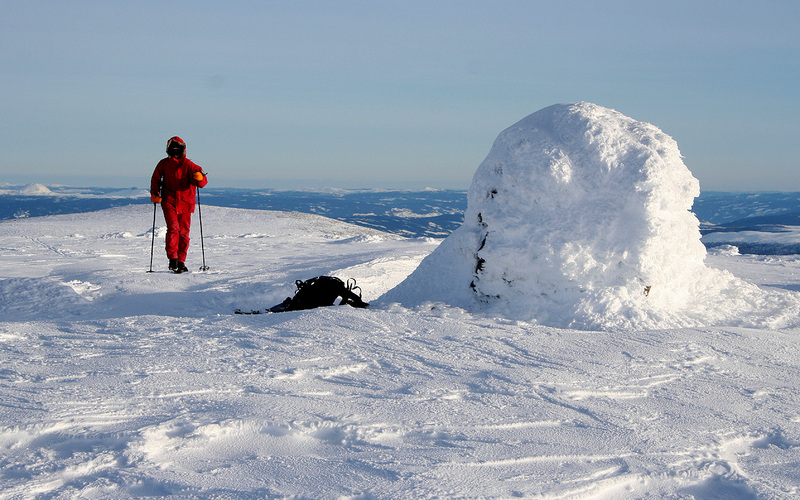 Pål Jørgen arriving at the Vennisfjellet cairn. 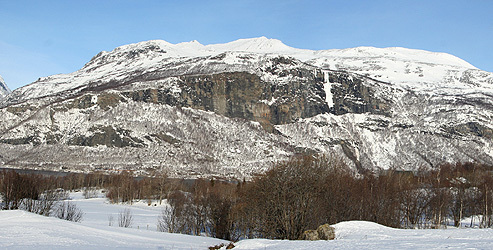 Hurrungane as seen from Vennisfjellet. Jotunheimen summits as seen from Vennisfjellet.